To many, especially in the United States, the history of the Soviet Union remains a very confusing (and confused) topic, muddled by decades of Cold War era propaganda, misinformation, and paranoia. We all know about Stalin, the KGB, the gulags, the nuclear arms race, but what we missed amid all the anti-Communist sentiment was the story of the Soviet people themselves. Russia may still be considered America's greatest enemy of the 20th century, but what of its people? The ordinary citizens who were just as afraid of the United States as we were of the USSR? As our two governments stared each other down on the brink of nuclear war, Russia's people went about their every day lives, much like their American peers. In a different world, yes, but not so different from us as we would have liked to think. And as the Soviet Union came to its end in the late 1980s, an entire generation of Russian citizens was coming of age, and about to have their lives changed forever as the iron curtain disappeared before their very eyes. 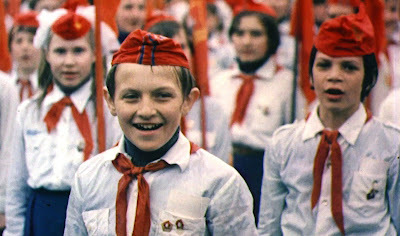 Young Soviet Pioneers on Red Square during a May Day demonstration, Moscow, 1977 – from the documentary film MY PERESTROIKA by Robin Hessman. Those young people who grew up under Communist rule, only to have the rug yanked out from under them just as they became adults, are the subject of Robin Hessman's remarkable documentary, My Perestroika. It's an intimate and revealing look at the lives of five schoolmates from Moscow who grew up behind the Iron Curtain, all now parents themselves and reflecting upon the events that shaped (or didn't shape) who they are today. There's Borya and Lyuba, two married history teachers who once saw the USSR in very different lights. Borya, a nonconformist who enjoyed sticking it to "The Man," and Lyuba, a former Soviet Pioneer and Russian patriot whose heart would swell with pride at the strains of the national anthem, have made a life together in a world neither really recognizes. There is Ruslan, a former punk musician whose music is still raging against the same injustices. There is Andrei, whom Capitalism has given the chance to open up his own chain of apparel stores for men. And then there is Olga, a single mother, whose life took a surprising twist after the Soviet Union's collapse. Borya and son Mark watching home movies of Borya’s childhood during the 1970s in the USSR — from the documentary film MY PERESTROIKA by Robin Hessman. Each has gone on to have families and build lives in the new Russia, as Hessman juxtaposes their own childhood with that of their children, drawing haunting parallels between modern Russia and the Russia their parents knew. It's a personal history of the Soviet Union, a look at historical events not through the great governmental machinations or political events, but through the people who actually lived it - it's man on the street history. My Perestroika looks at what the Russian restructuring meant not in the grand scheme of world history, but for the individual people who were actually there. Despite great initial changes - food shortages and the like, everyday life went on as normal for the most part, post-Iron Curtain. Hessman paints a compelling portrait of epic history as personal drama. As its tagline states, "a nation's history is personal," the film captures that sense that real history isn't found in history books, it's found in home movies and personal stories of tragedies and triumphs by real people, not larger than life figures who are little more than distant legends. Everything comes full circle, and as the children of the last Soviet generation grow up in a new and different world, and we are left wondering just how much has changed. It's an engaging look at a world still foreign to most Westerners, that may not quite be as foreign as we expected. MY PERESTROIKA | Directed by Robin Hessman | Not Rated | In Russian with English subtitles | Now playing at the IFC Center in NYC, opens April 15 at the Laemmle Sunset 5 in LA. I saw this film over this past weekend and absolutely agree with your rating and deft assessment. It's the second soild documentary I saw at the IFC Film Center in successive week's with the first Patricio Guzman's NOSTALGIA FOR THE LIGHT.